It is owned and run by myself, Kath, with the help of my husband John & Penny our dog. John was born and brought up in Ailigean B&B InvernessInverness so has a wealth of local knowledge to share. To anyone interested he is also a very keen fisherman. At Ailigean you will receive good accommodation with loads of great highland hospitality and I will do all I can to make your stay memorable. 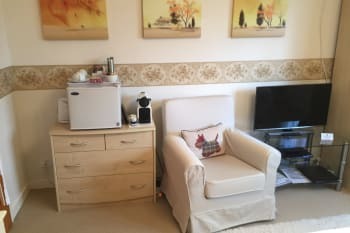 Rooms on offer come with hospitality tray, espresso coffee maker, small fridge, TV with Freeview, dvd player, hairdryer, iron & ironing board and free wifi. 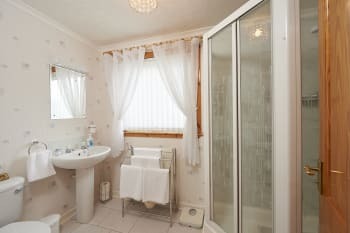 The large private shower room and toilet are solely for guest use. There are no rooms available at Ailigean B&B for these dates. We absolutely loved our stay with Kath and John! The room was cozy and comfortable, downtown was just a short walk away over a charming footbridge, and the homemade breakfast was wonderful! Our hosts made our four-year-old feel right at home - we only wish we could have stayed longer! Do yourself a favor and visit Leakey’s secondhand bookshop downtown (it’s a two story dream out of a movie) and have a pizza at the Black Isle Bar! Kath and John were absolutely wonderful hosts. We couldn’t ask for any better. Highly recommended. We would definitely stay there again when we return to Inverness. Just back from a fantastic overnight stay at Ailigean B&B. Kath and John couldn't have been more friendly, helpful or welcoming.The room was spotless, everything we needed, and my daughter loved the bunk beds! Would love to stay again, and would recommend to anyone visiting Inverness. Stayed for the Inverness half marathon, so the start was right round the corner. No hassle at all. Lovely walk along the canal which is right next to it. Kath & John welcomed us in their lovely, lovely home and we had an amazing stay thanks to their kindness and great hospitality! We will gladly return. Stay at Ailigean - you won't regret it. Kath and John were excellent proprietors and couldn't do enough for us to make our stay as comfortable and pleasant as possible. The whole property was spotless and the rooms were equipped with everything we could possibly need for our stay. Leaky' Second Hand bookshop is a must see for all the book lovers and it is conveniently situated in the city centre. Lovely Kath! This is a unique chance of getting to know the warmth and the hospitality of Highland’people. Kath and John couldn’t have done more to make us feel at home. We’ve never felt so very well received in any other B&B ever. The acommodations are very cozy in a a very nice neighborhood, just a short walk from the centre. I’d definetely recommend this treasure for all travelers. There are a number of good restaurants in the centre and this is not a reall issue. The best atractions in my opinion are the Loch Ness tour and a visit to Glen Distillery. You have clearly given some thought to the comfort of your guests and the appeal of your B&B. I can't see any way to improve things. British road signs are hard to follow. So many roads and roundabouts! If travelling by car, get a good map and plan your route carefully. We stayed here for a few nights and it was truly lovely. 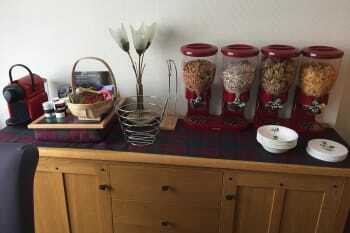 Kath (the owner) includes so many nice touches into the room that you don’t get in other place; including robes, slippers, a mini fridge with water, an exceptional range of tea, little chocolates and shortbread that is replenished daily. Kath and her husband are so kind and seem to truly enjoy having guests, they made a few dinner reservations for us, were always interested to chat and could not do enough for us. 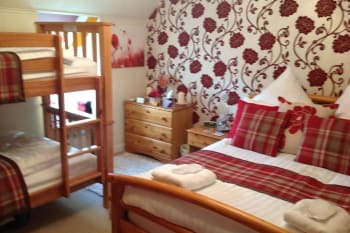 The room we had was beautiful, exceptionally clean, spacious and the beds were really comfortable. The shower was large and had the best water pressure. We had 2 cooked breakfasts and 1 day with porridge and they were all delicious and plentiful. Town is walking distance away which is really helpful because parking in Inverness is a nightmare. This place is great, We’ll be back for sure! Swim in the Loch Ness! It’s cold but exhilarating haha! only stayed one night, so didn't have a lot of time to look around, but found places to eat and drink in the evening. lovely couple very amiable good breakfast very clean . sheets changed twice weekly 5 STAR accommodation . international cuisine in town . Ailigean is a well-equipped and very clean B&B. Our room had a separate shower & toilet, but this was directly opposite the bedroom and was exclusively ours. The owner was very friendly and helpful, and breakfast was excellent. Very convenient for the Caledonian Canal locks. Simply fantastic. We really felt at home,Kath seems to be born to do this job,we really love her!!! We had a wonderful stay at Inverness. Cath has been great, she did everything to make our stay perfect. We had a great breakfast, the room was big, clean, cozy and with a super comfortable bed. I'll definitely stay here again, if I come back to Inverness! We stayed just one night.. A suggestion, book the restaurant for dinner in advance! Hospitality is second to none. Very welcoming and friendly. Would definitely recommend Ailigean to anyone. Town centre within easy walking distance. Cath is very helpful and kind person. She has an incredible house and there is and a very tasty breakfast. Excellent, 10/10. This place is just outstanding for a B&B. The moment we arrived, we were greeted with a smiling face. Kath took us in even though we were very late, she showed us our room and the dining place for the next day's breakfast. The room was impeccable, with exceptional attention to detail. There were earbuds in the bathroom. The toiletries were beautiful. They also had a small refrigerator in the room, with bottled water. Loch Ness cruise by Jacobite is a must! Kath and John were very friendly and obliging, couldn't have been any better. Location was excellent, yummy food close by, Kath even rang through with our booking for dinner. Please go and have a ball. Ailigean was a lovely, very clean b&b and we had a lot provided for us. The value you get for your money is fantastic. The staff (John and Kath) are both very friendly, very helpful, and we had a very warm welcome by both. The breakfast was amazing, Kath is an incredible cook! Number 27 is a lovely cosy pub and has lovely food! Ailigean B&B was a very lovely place to stay! It was our favourite B&B during our Scotland trip. Our room was spacious, clean and beautifully decorated. The ensuite bathroom was quite big with cupboards to put our things away and a large shower. Very clean and beautifully decorated as well. Kath made sure we had everything we needed and replenished our little fridge with water daily. The nespreaso machine in the room was a really nice touch too. Kath was also very helpful in finding us places to eat and even made reservations for us. We would definitely return and recommend Ailigean to our family and friends. Quiet and Nice B&B with personal as well as professional staff. Some would say its location is a bit away from centre but we consider it a charming walk through classic small houses. A very nice b&b.The room gas all the comfort (n espresso machine too!). Breakfast is very goodbut the real strenght is the owner. She is friend And. immediate lu puto you at esse. Fabulous place !Everything was perfect ! We had an amazing time and loved the place. The hosts were great and very welcoming, we highly recommend. extremely friendly, outstanding supportive and very very clean. Kath was incredible! My fiancée and I were celebrating our engagement and Kath not only got us a bottle of champagne, but she wrote us a sweet card as well. The rooms were clean and had everything you could need (toiletries, ear plugs, sleeping mask, robes, slippers, tea, hot cocoa, biscuits, water glasses, etc.). The bed was incredible comfortable and we had more than enough room for the two of us. Our room even had a bunk bed that could be great for a group of four or a small family. Kath set-up reservations for us at The Mustard Seed which was incredible and very tasty. I'd also highly recommend the trip to visit the Culloden battle field to learn the tale of the Jacobites and Scotland's fight for its independence. Thank you Kath and John for the quiet and comfortable accommodations. Your personal touch and restaurant recommendations helped to make our stay in Inverness a memorable and enjoyable one. Our second stay with you was like coming back to the home of good friends and your home and garden is a little slice of heaven! Friendly,homely and excellent quality. Freshly cooked breakfast with very good choice. Comfortable bed with everything needed. Owners very helpful. Quiet,good parking but close to town and also lovely walk down to canal basin. Excellent hospitality from checking in to departing. Could not fault anything. Kath was lovely! The location just off the canal was perfect. We had a delightful breakfast and chat with the other guests. We wish we had stayed longer! Watching the boats in the canal! Everything was excellent, we have been very satisfied. A lovely place to stay. Our hosts were great,and more than happy to help us out. Kath booked a restaurant for tea for us.and dried out our wet jeans when we got back. Exceptionally clean and tidy, with everthing provided that we needed. Breakfast was lovely. Would highly recommend this place. It's only a 20 minute stroll into town. Be prepared for all weather. We had a perfect stay at Ailigean B&B. Warm welcome, nice and clean room and a very good breakfast. We enjoyed our stay. Very friendly and obliging hosts. Great breakfast. A place to return. Many restaurants in short walking distance. Rommet hadde absolutt alt du måtte behøve. Vi ble kjempegodt mottatt, og eieren av B&B gjorde alt hun kunne for at vårt opphoød skulle bli bra. Kommer gjerne tilbake, og anbefaler steset på det varmeste. Our first B&B. Excactly what we came for. Lovely welcoming and friendly, great breakfast! We passed a wonderfull moment with you. We saw dolphin next inverness and the loch ness and the urquart castle. It is a beautifull part of Ecosse. hosts were very gentle, Kath has given us good tips. (restaurants etc).Bed was awesome and breakfast delicious! large bathroom seperate and only for us. weve got everything we need! forbus : 10 points! Kath and John welcomed us as part of their family. It was pity we stayed just one night following our tour of the highlands. Warmly recommended! Kath reserved for us the restaurant "The WaterFront" that was great. The stay was excelent,and Kath and Alexander are kindest owners. Thanks for all! Kath is a very indulgent host and has a keen eye for detail to ensure that nothing is out of place. She & John are very courteous and ensures that the stay is comfortable and every aspect is taken care off. Very easy to make friends and you get a homely / motherly treatment. Highly recommended. While Kath will provide you a lot of details herself, the center of the town is just a 10 minutes walk and it is very scenic all around. There is place to keep your car but that should only be used if you are planning to go out of the town. We were like at home: nice stay and lovely people, with all the facilities with us. 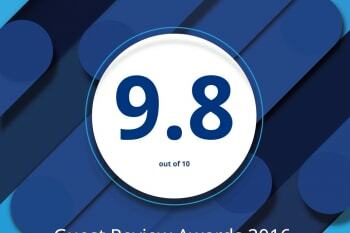 Absolutly recommendable. Such a nice, warm welcome we received at Ailigean B&B! Kath showed took her time making us feel at home and showing us around the house. We instantly warmed towards her, John and their lovely dog Penny. We had the whole top floor to ourselves, which felt nicely private. 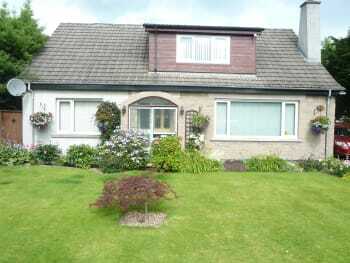 The property is very well looked after. Kath puts lots of effort into the small details, and it doesn't go unnoticed! Breakfast was great! 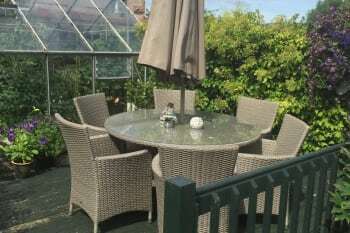 The location is good, in a quiet street about 10 minutes from the city centre. When we came home in the evening, she approached us to have a chat and make sure we had a nice time in town. The only downside to our stay at this B&B was that we only had 1 night here! it was all perfect and i would like to reccomend it in order you to meet the beautiful person who will host you, she will make your day! When you will go in ther s a sign that says "come in as a guest, leaves as a friend". It is what happened to us, it was a relaxing staying with them, they are really lovely people. The room was perfect, with some specials like the DVD player and the nespresso coffee machine. The breakfast were execellent with mostly local products. I really suggest to book here. Kathe and John are great hosts. The decor of the house and the treatment is unbeatable, a spectacular breakfast. When we arrived we had separate beds thinking that we were not a couple being two boys. They apologized and put us a double bed without being asked. Very friendly and gayfriendly. The little dog is adorable. We want to live there. Eat at the mustard seed restaurant in town- but must book in advance. Very nice stay.Kath And John are Very friendly And make you feel like at home. Every thing was perfect Thanks a lot!! Incredible stay!!! The owners are very nice and friendly people. All perfect!!! I strongly recomend this B&B to other people. The best B&B we have ever been. Than you for all. Owners are lovely people, the room was far above our expectations, more than complete in every detail with only one goal: make the guests 100% satisfied. Kate & John succeeded in our case! In one word excellent. Visit the Black Isle Brewery Pub with more than enough choice of everything to drink. Kath and Johnny (and their dog)extremely friendly. Made to feel very welcome. Nice, fresh, clean and airy bedroom. Bathroom directly opposite bedroom well stocked with toiletries and towels. Excellent breakfast selection, and Kath went out of her way to meet dietary requirements. Well versed on local area, sights to see and restaurants to try. Will certainly visit again. Must see - Castle viewing tower. We stayed really very well. The family room was very comfortable. There was really everything that could be necessary for you, even a Nespresso coffee machine! Breakfast excellent! Good position, you could reach the centre of Inverness in about 15 min on foot. Kath and her husband very very kind. Absolutely perfect. Hospitality from the heart, this place is brilliant from welcome to farewell. Kath was a very accommodating and thoughtful host. The room was large and clean, it also included a sink! Bathroom was the same. Cannot fault a thing! Go to Oakwood Restaurant. Amazing. Check out Loch Ness. A lovely B&B, spotless and very comfortable, with wonderful hosts. We truly enjoyed our stay, and wished we could have stayed longer. 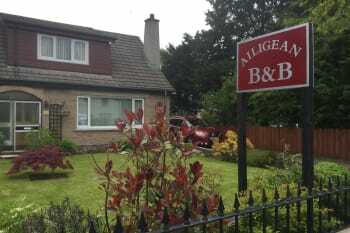 If we are in Inverness again, we will definitely try to stay at the Ailigean B&B! Very welcoming, and great attention to detail. It would be hard to see anything that needed improvement. Just ask Kath - she will arrange it all for you. This was the most pleasant stay off our holiday in Schotland. We had a beautiful room and everything was very clean. Kate and John helped us with everything we asked. Just a 5 minute walk in too the city. The breakfast was delicious. Superb B and B. Cannot fault it. Warm friendly welcome, nice clean room of a good size, good bathroom, super breakfast. All spotlessly clean. Try The Mustard Seed restaurant. Great atmosphere and good food at a reasonable price. Great service from very friendly and helpful hosts. They have thought of just about everything that a guest might need - including a Nespresso machine and little chocolate treats in the room! Fabulous breakfast too. We highly recommend this place and very good value for money. Our host suggested adding Culva Cairns to our trip to Culloden battlefield. Glad we did - very impressive neolithic tombs that we had never previously been aware of. It is a beautiful house and yours and the owners are very very kind. The Ailigean B&B is well and thoughtfully fitted out. The hosts are friendly, accommodating and extremely helpful. Would stay again - highly recommended. The centre of Inverness and its restaurants is within walking distance - no need to take a car into town. Make restaurant reservations if you can - many were booked out, even midweek and early in the season. 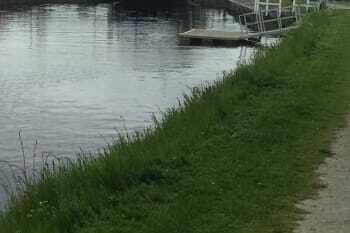 Take a short walk down to watch boats going through the locks on the Caledonian canal. Outstanding!!! 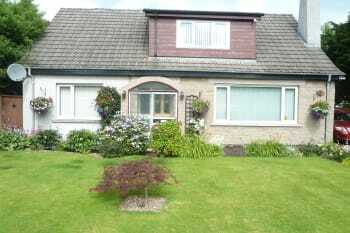 Friendly welcome, very comfortable and clean Room, beautiful home, Kath is lovely and helpful, with a really good attention to detail. Very good wifi. Penny is so cute!! Can't wait to go back! We do recommend! Everything's perfect. They provide accurate info and advice. My mom and I thoroughly enjoyed staying here during our 10 day trip around Scotland. The room was so comfortable and clean. Kath did not miss a beat with supplying us with anything we could possibly need! The bathrobes and nespresso machine were the special touches that make this a 5 star property! (Along with her kind, cheery disposition!) We enjoyed our breakfast the next day. Along with the long chat we had with Kath in the morning. We could have stayed all day but had to get up and out to Culloden. I would recommend anyone stay here. Cath's attention to detail is top class. She has thought about every thing any traveler could want. The room and bathroom are beautifully furnished and very welcoming. Very nice B&B. The hosts could not have been any friendlier. Very comfortable room. 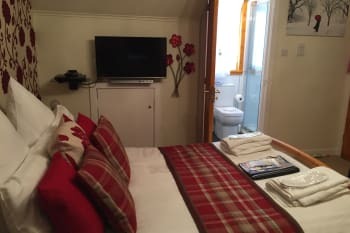 Large shared bathroom with a good shower. Although shared with I think two other rooms the host was only taking bookings for one room or a travelling group I beleive. Very good breakfast. We thoroughly enjoyed our stay at Ailigean B&B and would go back in a heartbeat. The owner was beyond accommodating and friendly, even though we had a very early morning flight and arrived later at night she was up to greet and see us off and even organised a breakfast for us at 5am! There was a coffee machine in the room and even dressing gowns and slippers. The bed was so comfy and room was very quiet. Lovely stay, I wish we had longer there! Una experiencia excelente. Lo recomiendo encarecidamente. Kath very friendly and helpful in recommending places to eat. Nice treats in room/bathroom. Private use of bathroom. Excellent breakfasts watching birds in garden. Number27 for food - lovely meal and good service. Was made very welcome by Cath. Could not find one thing to complain about, the place was spotless breakfast plenty. Had our two young granddaughters with us and we're made very welcome too. Will defiantly go back. The highest standards and attention to detail were evident throughout. The museum and art gallery are worth a look. Inverness is also a good place to stay if touring the Highlands. Excellent facilities, a very comfortable bed, great breakfast. Everything was really good and most importantly, very friendly people. we felt like we are family guests. Loved to watch the birds with a delicious breakfast and the dog Peny is so sweet. Highly recommend place. Perfect stay. Very nice room and lovely owner. Probably,the best place we have been. If you go to inverness, you must stay here. There is plenty of restaurants besides the river. From the first contact, which occurred minutes after our online booking, we felt that we made the right choice. The warm and friendly welcome by the owners, Kath and John, gave us immediately the feeling like coming home! The house is extremely clean, the attention to details is perfekt and everything we needed was available, and even beyond! 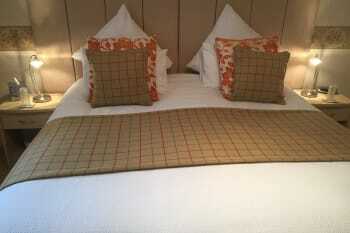 The bed is very comfortable and the room nicely decorated. We loved the Nespresso Machine in our room. The breakfast was just perfect with excellent choice. A five star B&B could not offer more! After dinner we spent a wonderful evening with Kath and John. Thank you for the drinks and for the unforgettable evening and interesting conversation. We left with very nice memories and it was like visiting friends. We´ll definitely come back again. Thank you so much Kath and John. Absolutely brilliant stay! 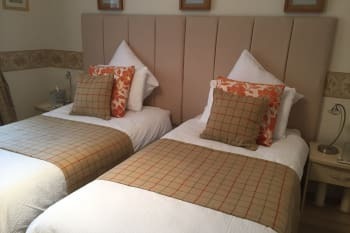 Kath (and Penny ;) were just delightful, the room and facilities were impeccably clean and the bed was super comfortable! Breakfast was delicious, the wifi worked very well and Ailigean is a straightforward walk directly from / into Inverness. Fulfilled our needs entirely, thank you! Very welcoming and friendly. Good facilities. Home from home feeling. 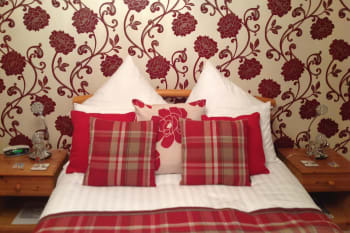 Superb accomodation, bedroom of the highest quality with lovely bed and wonderful bed linen. Excellent hospitality tray provided. Breakfast was superb and Kath was excellent throughout. Very friendly and helpful. The room was comfortable and well set up. Get advice from the owner about local restaurants. We had a good meal after being given a recommendation. We had a lovely stay with interesting chat and we felt wonderfully welcome. Inverness is a beautiful place to just walk around and see the old part of town, a huge old bookshop, the outside of the castle, the churches and much more. The Fish n Chips shop at the bus station was great! Gluten free batter and very tasty food. Excellent service. We really enjoyed our stay.